The best hotel for families that I have experienced in France. Excellent food + excellent kids? club. Well-being and relaxation stay, playful and lively, sporting and cultural, authentic and gastronomic with a cuisine of ocean-coloured terroir... With us, everything is planned to meet the pleasure of everyone and satisfy young and old! Like a great ship nestling in the greenery between the pine forest and the ocean, this club enjoys an ideal setting in front of the marina of Bourgenay, 12 km from the seaside resort of Les Sables d' Olonne. Just a few minutes walk from the beach, via a sandy path through the dunes, this club sees your holiday in a big way. Aquatic area with outdoor swimming pool, heated indoor swimming pool with waterfall, wellness area, volleyball court, squash, billiards, bowling, dance floor... Play your games, everything is fine! Immerse yourself in a quiet and relaxing environment, away from the hustle and bustle of big cities. An unusual place, built like a cruise ship. A place of happiness anchored in the heart of a pine forest and open to the ocean. This horseshoe-shaped ship was designed to blend perfectly into its natural environment by recalling down to the smallest detail its marine soul. The art was considered so as to integrate perfectly into the natural environment by recalling the smallest details of its marine soul. The artistic journey that marks out the club matches its image – audacity and creativity! You have the choice of half-board, full-board or accommodation in an apartment. 121 modern, spacious rooms for between 1 and 4 people, with loggias overlooking the sea. Our rooms are spread over 3 floors with elevators. Type of bed: 1 room with 2 single beds and 1 single bed in the entrance. 14 x 2 room apartments for 4-6 people with view over the pine forest. Possibility of eating in the restaurant. Free access to the children’s club. Type of bed : 2 single beds in the entrance, 2 single sofa-beds in the drawing-room and 2 single beds in the bedroom. Taste the pleasures of a cuisine inspired by the sea with a very varied offering of fish. Every week, the chef will provide a seafood buffet and a dinner with floor show. Choose the formula that suits you: half-board or full board. Lunch 12.30 p.m. -1.30 p.m.
Dinner 7.30 p.m. -8.45 p.m.
Our bar overlooking the outdoor swimming pool welcomes you after a day of relaxation in the swimming pool, to share a convivial moment around a cocktail while playing bowling on one of the 4 tracks available. Later in the evening, enjoy the dance floor of the discotheque space until midnight depending on the activities. 100% Leisure Programme: Activities Guaranteed and Included! Our entertainers will provide entertainment, fun and smiles throughout your stay. Our qualified professionals will offer sports and amusements throughout the holiday. Our numerous facilities guarantee you relaxation or toning exercise, whichever you choose, so that your holidays will feel like an exceptional moment. Gym tonic: Every day. Gym and zumba for a refreshing and invigorating holiday! Mölkky, Finnish bowling, soft bowling, indoor petanque. If you like pampering sessions, you will love our Three-star hotel and spa residence at Divonne-les-Bains, la Villa du Lac and our three-star hotel, la Villa Marlioz, at Aix les Bains with its 1000m² of hydrotherapy facilities. While the grown-ups are enjoying their activities, children are also on holiday. Qualified professionals will look after your children aged between three months and 17 years. Activities and atmosphere guaranteed! The Nursery: Three months to under three years. Qualified professionals will welcome your baby in safe structures with areas for play, naps and meals.€ 112 for six half-days, to be reserved when booking. Creative activities (drawing, fancy dress, entertainment) and discovering nature (treasure hunts, enjoyable walks) as well as festive meals, a big party and cinema once a week. Sports and games, lots of laughter, fun and making friends, such as for example the team game played in the park called “the experts”, looking for clues, a kite-flying competition, and lots of outdoor games.Festive meals, a big party and cinema once a week. Compass-reading course, bowling, weather workshop, ultimate competition (frisbee-throwing), volley ball... playing sport with lots of pals! Teenagers will enjoy a space all their own with turntables, musical instruments, table football, cartoons, DVDs, computers and a wi-fi area. They can organise their day and decide on their programme with the help of the team leaders who organise interactive games (Wii®, Xbox®, Playstation®, Hyper Master) and sporting competitions ( volleyball, soccer, sailing, sailboarding). Evening with a DJ and discotheque at least once a week. Excursions are offered with a supplement. Children’s rates also apply to one-parent families ! The children will take on the role of detective during this mysterious stay. Between investigative games, escape games and role-playing games, our animators will entertain budding investigators who will have to show insight and imagination! The children make their own documentary in workshops run by audio-visual professionals: script and dialogue, acting, operating the camera and editing. When the Oscars are awarded, they can walk down the red carpet and present you with their masterpiece. What a souvenir, the DVD of their film, and as a bonus, a “making-of” and all the outtakes! Engine... Action! From scriptwriting to editing, participants will discover all the tricks to use a camera, make a success of its framing and video editing. AERO CONCERT: a summery, musical and relaxed moment! TONIC GYM: gym and zumba for a regenerating holiday! TENNIS ACADEMY: over 5 days, 2 hours in the morning of initiation or improvement. ESCAPE GAME: a great game for parents and children (from 7 years old). Welcome to your spa – a place that’s all about to relaxation and wellness and the ideal opportunity to help you recharge your batteries in the gentlest possible way. Recharge your batteries throughout the year with programmes designed* by the team in our Wellness Face and Body Zone. Our wellness* breaks for 3-12 year-olds, which take place alternately in the morning and afternoons throughout your stay, give you all the freedom you need to enjoy the daytime activities. We attach great importance to beauty through natural products, which is why our expert team has chosen a range of care products from the Thalgo Cosmetic laboratory – a leading international player in marine beauty products. 1 complete facial, 1 relaxing massage. 1 back modeling, 1 facial modeling, 1 cranial modeling. 4 spa treatments chosen by the institute, 1 relaxing massage. 1 exfoliation, 1 relaxing massage, 1 massage under afusion, 1 light treatment. 1 multijet bath, 1 exfoliation, 1 facial radiance treatment, 1 beauty treatment for hands. 3 multijet baths, 1 scrub, 1 exfoliation, 1 massage under fine mist, 1 thermotherapy, 1 light treatment, 1 light leg care, 2 wraps, 1 back massage, 1 relaxing massage. 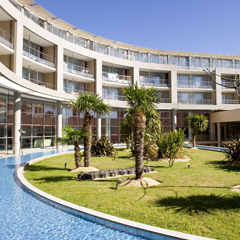 Ideally positioned between the ocean and a pine forest of more than 80 hectares, Les Jardins de l'Atlantique, our Three-Star Resort, is in the ideal location for you to get your energy back in a thalassotherapy stay in the Vendée! Its position, 200m from the yacht basin and close to the Sables d'Olonne, its position is an illustration of the charm of the Vendée with everything conveniently close by. The Vendée has the advantage of offering a variety of settings while benefitting from its exposure to the Atlantic. Here, wild nature is close to the urban centre of Sables-d'Olonne making it a unique setting. Oyster cultivation, fishing and the salt marshes are to be found alongside dunes, cliffs and the coastal forest, creating the Vendée’s unique landscape. In addition to Sables-d'Olonne, the region is full of interesting and historical places to visit such as La Rochelle, the Route des Salines, the islands of Ré and Noirmoutier and the Poitevin Marshes. The Grand Parc Le Puy du Fou® opens from April 6 to November 4, 2018. Travel out of time by following our guide for an unforgettable day. At your holiday club beside the Atlantic, the Club’s Kiosk will give you all the information you need for your excursions, rambles and unmissable events in the region.Every week, a guide will suggest excursions, such as to the Sables d’Olonne, theVeillon beach, La Rochelle, the Château de la Guignardière, the Puy du Fou® Park, the islands of Ré and Noirmoutier, the Poitevin Marshes, and more. Horse-riding, mini-golf, golfs at preferential rates (for those staying at the club): Port Bourgenay (500m away), la Domangère (28 km away) and Les Fontenelles (40 km away). Nantes Atlantique International Airport is 100 km from Port Bourgenay. The Sables-d’Olonne railway station is 14 km from the hotel. A transfer can be arranged by the club* from the railway station. Contact the club directly a minimum of two weeks before your stay. HALF-BOARD FORMULA: Accommodation in half-board (breakfast + dinner), entertainment for children and adults at the times indicated, access to the club's sports facilities (excluding bowling), daily cleaning. In all Vacances Bleues clubs, during the school holidays, opt for the All Inclusive formula which includes full board and drinks package detailed below. Supplement of 203 € / week only during the school holidays. FULL-BOARD FORMULA: Accommodation 7 days/7 nights in full board (breakfast, lunch and dinner), entertainment for children and adults at the times indicated, access to the sports facilities of the club, daily cleaning. Tourist tax and drinks not included. Supplement from 54 to 144€/week. Full board includes meals from dinner on the first day to breakfast on the day of departure. RENTAL PACKAGE: Accommodation, towels and household linen, maintenance kit. FORMULA CARE INCLUDED IN HALF-BOARD: Accommodation 4 days / 4 nights from Monday evening to Friday morning, half board and the following treatments: 1 aquatic scrub, 1 light facial, 1 relaxation bath, 1 hydrojet mattress, 1 cranial modelling, 1 back modeling. ALL INCLUSIVE Formula (during the school holidays): In all Vacances Bleues clubs, during the school holidays, opt for the All Inclusive formula which includes full board and drinks package detailed below. Supplement of 203 € / week only during the school holidays.